How not to ruin LPM's sensor with a 405-g2 lens? I feel stupid for asking this but is there a trick to LPMing a laser when using a 405-G2 lens? I bought one from DTR for an upcoming build but was curious to see what kind of improvement it would give me on my ~710mw 445 but here's what I'm running into. Before LPMing any high power laser I always do a "cardboard test" to make sure I'm not going to smoke my LPM's sensor but this time no matter how I focused the beam it'd smoke the cardboard almost instantly. I have a feeling I'm just not hitting the right focal point but it seems I can't defocus it enough close to the aperture to not etch the sensor. You can always defocus the laser. In front of the focal point or back of the focal point. As long you don't focus on the LPM you are fine. Cardboard is bad example. It absorbs too much energy. That's what I do with the standard 3 element 445 lens that's normally on it but for some reason I can't hit that point. The focal point is clearly visible. I have a hunch that the focus adapter is bottoming out on the heatsink. I'm going to remove it and see what happens. I think you may be right as well. When you get close to the 1W range it may just absorb too much and start burning. edit: I was right. Not bad I did a quick before and after and got 650mw with the 3 element 445 and 760 with the G2. "L" bracket right next to out Thermopile. beam profile onto the Thermopile. 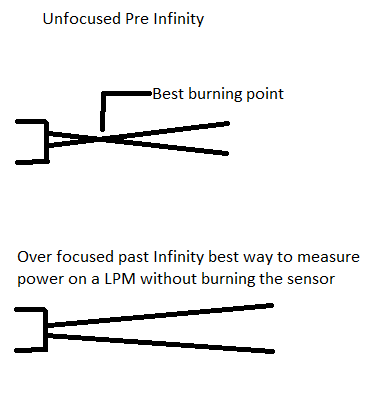 That's probably the best way - focus the laser to inifinity and then measure it. I case not all of the beam hits the sensor you can try to focus it a bit, but only if required. Sensors are usually built to measure the total power impacted on their sensitive area, so there should be no reason to attempt to focus a laser beam onto a small spot on the sensor at all. as the "test" area to adjust a High Powered Laser's beam.